Tuesday January 29, 2019 7 p.m.
Talisman Roses, the Festival's 12th world premiere of a Tennessee Williams play, will be directed by Marsha Mason, who is herself from St. Louis and has been nominated four times for an Oscar. 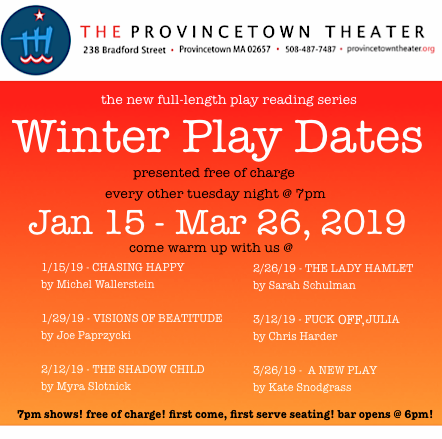 It will be performed alongside several other world premiere short plays on the theme of waiting by Charlene A. Donaghy (Gift of an Orange, 2012), and Festival newcomer Joseph Paprzycki. The Open Arts PAC in Bordentown, New Jersey will be presenting a FREE staged reading of my new play GOALPOSTS on Monday, November 14th at 7:00pm. Directed by Nicole Leario. GOALPOSTS is a story of America in 2016 - a country where older workers are being laid off because of their age and salary levels. It is also the story of their adult children who face underemployment and are affected by the ongoing opiate crisis. It is a new American tragedy. This reading contains mature subject matter. Open Arts PAC is conveniently located in Bordentown off of Route 130, next to Mastori’s Diner. The theater is also close to exits off of 295 and the New Jersey Turnpike. Fall opening reception for "Clique" South Jersey Artists by South Jersey Photographers. "Clique" features photographs of 16 of South Jersey's most respected and innovative artists, captured by eight of the region's most accomplished conceptual portrait photographers.